When the Christopher Nolan Batman movies started coming out, we were very curious to see how The Joker was going to be portrayed in the new dark, gritty, more realistic take on the Caped Crusader's story. Well, it may not be everyone's favorite version of The Clown Prince of Crime, but pretty much everyone can agree that the filmmakers still nailed it. He's a homicidal maniac who prefers spreading chaos with traps and schemes designed to unravel the hypocrisies of civilization rather than with poisonous laughing-gas and jack-in-the-boxes full of hand grenades. Whatever weapons he chooses (usually a knife, but sometimes he picks a gun or an attack dog), he still has a real knack for getting on Batman's bad side. 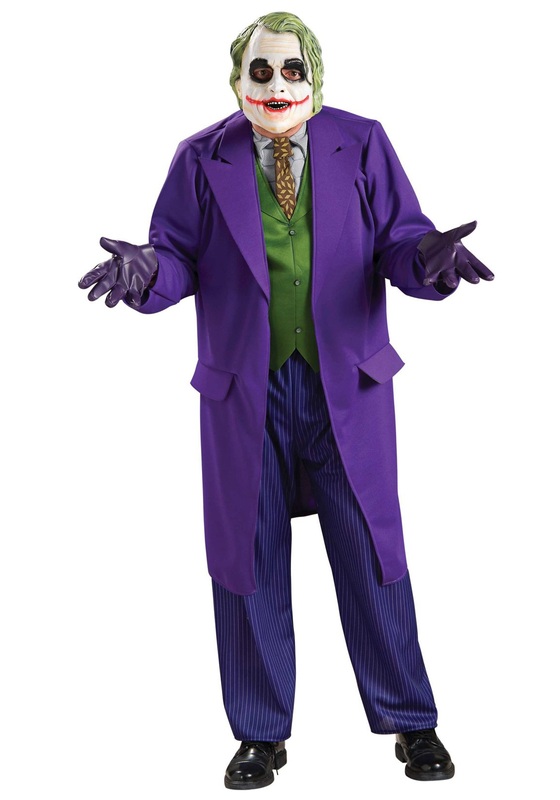 If you're feeling like siding with the bad guys, but don't want to deal with Batman searching for you, you can always just look like his arch-nemesis with this Adult Joker Costume. This officially licensed costume is designed to capture the look of The Joker as he played mind games with Batman and the people of Gotham City in the movie The Dark Knight. The green vest and shirt inset fastens to the inside of the purple outer coat to show off The Joker's signature colors. The included mask will let you ask people if they want to know how you got your scars without having to bother with messy makeup and prosthetics (or worse!). This costume will make sure you are looking sharp, before you get locked up in Arkham Asylum, that is.